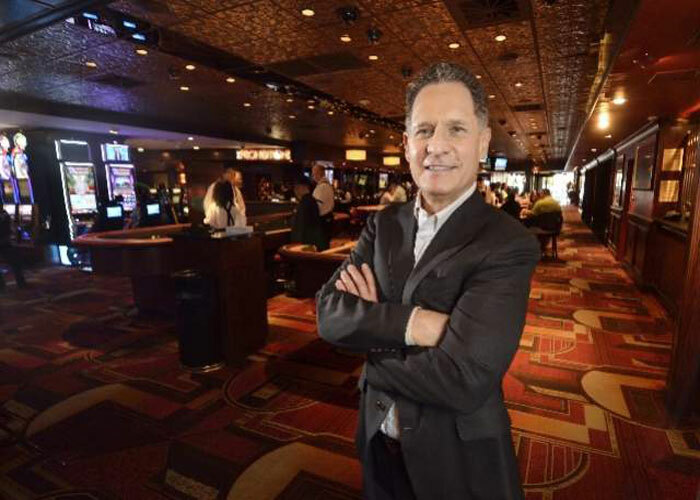 At age 12, Mark Brandenburg mopped the basement floors at Las Vegas' first casino: the Golden Gate at 1 Fremont St. Nearly 50 years later, he has his own office in the building as its president and shareholder. "When you ask about my history with the hotel, it is, first of all, fondness for the place because it is so unique," he said. "It's an authentic, original Las Vegas property. In terms of the building, we've preserved a lot of its history even as it's grown over the years." His transition from adolescence into adulthood is closely intertwined with that of Las Vegas. Fellow Vegas native and University of Nevada, Las Vegas history professor Michael Green said Brandenburg's background is a rich one. "He's remained of the place," he said. "He's a casino owner who is invested in and part of the community himself and that's more unusual now." Brandenburg wasn't born into the Golden Gate family. His mother met one of the casino's 22 original partners, Italo Ghelfi, while working as a cocktail server there. After they wed, a very young Brandenburg would pay an occasional visit to the casino. "My point of view growing up, I'd probably flash back to when I was like 5 years old and we'd come downtown for events," the now 61-year-old said. "I remember standing on Fremont Street with all the neon lights and Vegas Vic doing his ’howdy partner' thing." Eventually teenage Brandenburg started moving up at the Golden Gate. He went from janitor to busboy, then valet attendant. Over the years he enjoyed the city's various attractions. "I had a place like Circus Circus to hang out as a kid, ride the bumper cars, mess around," he said. "I guess where other kids might have cruised Main Street whatever their Main Street was we got to cruise down Fremont Street and the Strip." During his college years at Stanford University he said he was known as "the guy from Las Vegas" in his dorm hall. "In my first week in the dorm it was kind of funny because three guys from the dorm came walking into my room. They had a kind of solemn, serious look about them," he said. "They said, ’Mark, we need to talk to you. We want to run a casino night party this weekend. Will you run our casino for us?'" He confessed that he knew little about gambling at the time, effectively ruining his peers' vision of a Las Vegas native. His bachelor's degree was soon followed by a law degree from The University of California, Hastings College of Law. He began to practice in Las Vegas in 1979. After nearly 10 years at the law firm of Lionel Sawyer & Collins, Brandenburg and his brother Craig Ghelfi decided to buy out the Golden Gate's dwindling partners in 1990. Four years later, he became the sole owner. Green said the Brandenburg/Ghelfi family has owned the hotel casino for 60 years, longer than any other family in the city. In 1993, he joined a 10-person committee with the city's biggest names. They were tasked with redesigning Fremont Street as bigger attractions like The Mirage opened on the Strip. "I was ... the new guy down the street sitting at a table with Steve Wynn, Bill Boyd, Jack Binion, Jackie Gaughan and others," he said. "They're all fiercely independent businessmen with their own accomplishments, their own businesses." When Brandenburg first saw the completed 10-story Viva Vision canopy over Fremont Street in 1995, he felt it was a perfect fit. His next mission was to have his business flourish in the desert. That involved renovating the Golden Gate. The 2012 expansion came with 14 suites, two penthouses and an approximate $15 million tab. While he contemplated where to start the updates in 2006, Derek Stevens walked into the casino asking to meet with its owner. "I had an interest of getting into the gaming business and he had an interest in looking for a partner," Stevens said. "He was looking to renovate the property and upgrade the property, put in a new sound system, things like that. We personally hit it off." Derek brought his brother, Greg Stevens, into the mix and the trio struck a deal in 2008. Today Brandenburg owns 40 percent of the casino while the Stevens brothers claim 60 percent. The pair also co-own the D Las Vegas at the other end of Fremont Street. Derek said his partnership with Brandenburg evolved into friendship, often getting together away from work. He went on to explain how his pal is not just an excellent businessman. "I would say that he gives a great perspective on the history probably better than anybody I've ever met of downtown Las Vegas, of Las Vegas as a whole and of Fremont Street," he said. Green described Brandenburg as a "down-to-earth" businessman who is still committed to his hometown. Such a combination is rare in this city, he said. "You get a sense that he has a stake in Las Vegas ... in a different way from many operators who have a stake not just financial, but in the community," Green said. "(Other casino owners) do too and they express it, but his is in a different way due to his background." Whether he's in his office downtown or at a show on the Strip, Brandenburg exudes pride in his hometown. "To really be this diverse is really interesting because it wasn't so much when I was growing up. I think it was just starting to be that way," he said. "People came here from various parts of the country. My mom is from West Virginia, my stepdad was from the Bay Area, my father was from Kentucky. But it's just amazing how we've become this world-class city."